Shelly, who lives in Imagine!’s Charles Family SmartHome and participates in Imagine! 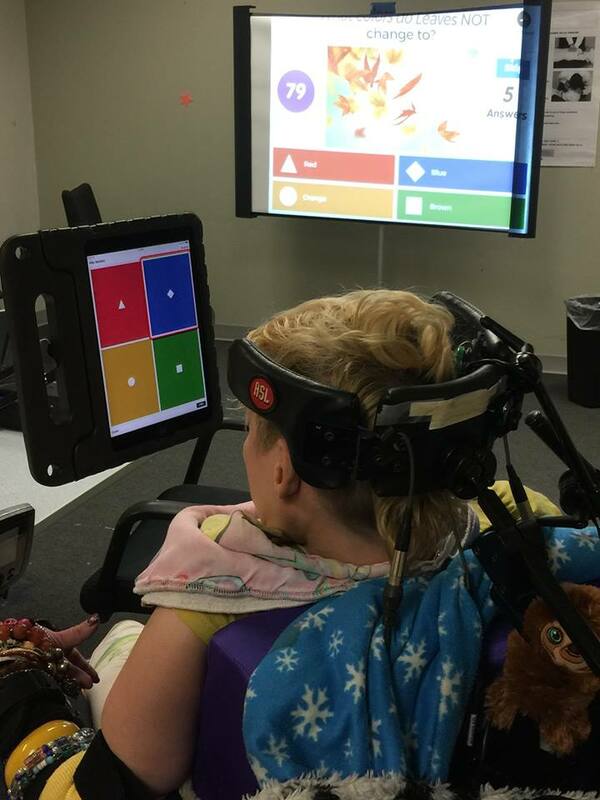 's CORE/Labor Source program, is pictured here using an app called “Kahoot” and an adaptive switch with an iPad to play an interactive quiz with her peers. 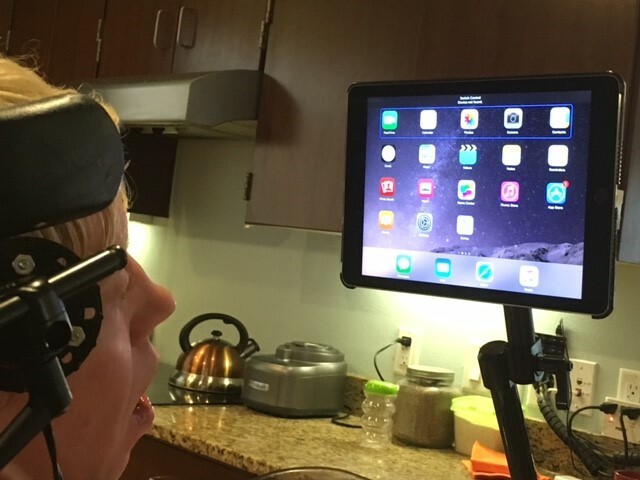 The iPad auto detects the choice options and then Shelly is able to choose which ones she thinks is the right answer! In the spirit of yesterday’s holiday, and to celebrate five years of volunteerism at Imagine!, today I am sharing short videos highlighting five volunteers who have truly made a difference at Imagine!. Of course, choosing just five volunteers was very difficult – last year 379 volunteers donated 8,784 hours of their time to support Imagine!’s mission of creating a world of opportunity for all abilities! The people we serve: They inspire and teach me every single day. Our employees: Dedication and passion abound among staff members at every level of Imagine!. They are difference makers in the very best ways. Our donors: The continued and generous support of those who contribute financially to our mission allows us to offer services above and beyond what our traditional (and frequently shrinking) funding sources allow. 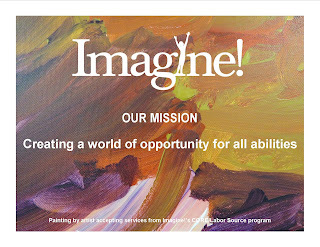 Our volunteers: Imagine! volunteers share their time and talent directly with the people Imagine! serves and with projects of all sizes, increasing the quality of support and services we are able to provide. 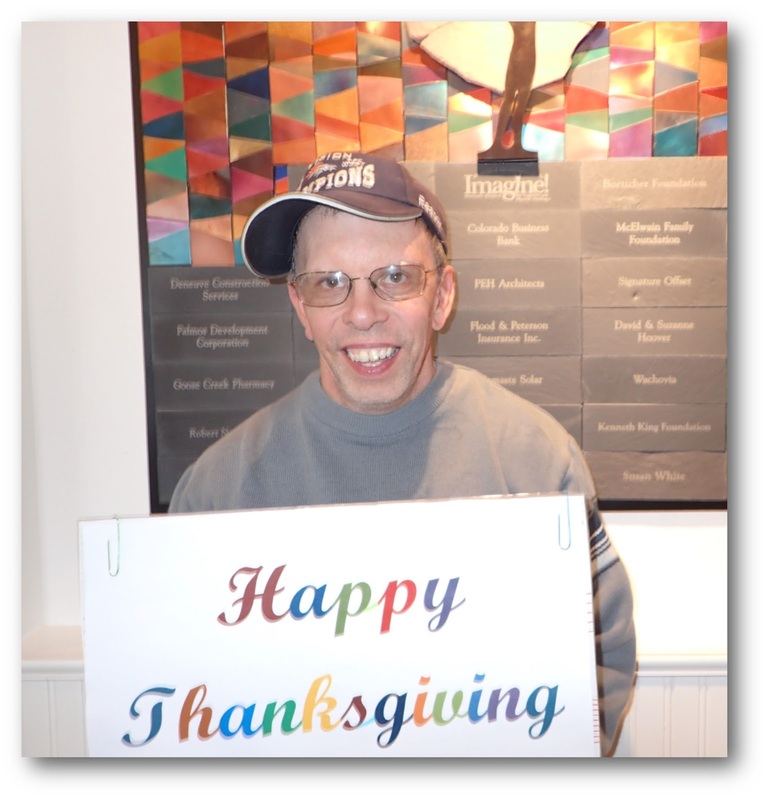 Our community: We are so fortunate to live in a community that embraces the individuals we serve and the work we do. We couldn’t have reached the level of success we have without our community’s demonstrated commitment to an inclusive world. You: Whatever your association with Imagine! is, if you are reading this right now, I thank you for your interest in creating a world of opportunity for people of all abilities. Today, I’d like to offer my sincere thanks to Dave Query, who is once again treating Imagine! consumers and their families to a traditional turkey dinner on Thanksgiving Day, Thursday, November 24, 2016. This is the 13th year Dave has hosted this event, which will again be at Zolo Southwestern Grill, 2525 Arapahoe Avenue, Boulder. Imagine!’s Volunteer Program officially began five years ago (of course, we had volunteers before, but it was a loosely organized effort). To celebrate five years of volunteerism at Imagine!, I am sharing on my blog short videos highlighting five volunteers who have truly made a difference at Imagine!. Of course, choosing just five volunteers was very difficult – last year 379 volunteers donated 8,784 hours of their time to support Imagine!’s mission of creating a world of opportunity for all abilities! We are grateful to them all, and hope that the five we highlight serve as a great representation of the many generous folks who so kindly give back to their communities. Today’s video features our fifth and final volunteer highlight: Leona Stoecker. Leona is in many ways Imagine!’s number one community ambassador. She works tirelessly on behalf of Imagine! and the people we serve. You are encouraged to read more about Leona’s support of Imagine! following the short video below. Leona Stoecker is a truly remarkable woman who has made a tremendous difference in our community. After more than two decades of direct involvement with government service at the local, county, and regional levels, including serving as Mayor of the City of Longmont from 1993-2001, she has since devoted herself to community service in the non-profit sector. In most cases, she has risen quickly to a position of leadership from which she has been able to guide each organization to strengthen and improve itself and the services it provides. It would be difficult to find another person in our area who has made similar contributions of effort and time or who could match Leona’s ability to rapidly understand a need and to involve and inspire just the right people to help. Leona’s involvement with the Imagine! 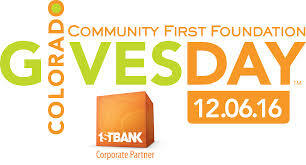 Foundation typifies her commitment to all of the non-profits she has served. In 2006, the Foundation board sought to increase awareness of its operations in Longmont, where it supported nearly 1,000 vulnerable members of the community. Research and discussion with Longmont residents led the Foundation board to believe that Leona could be the key to that effort. Board members met with Leona in January 2007, and she attended the annual Imagine! Celebration event later that month, followed by a board meeting in March. She was immediately enthusiastic and truly moved by the work Imagine! does in the community. The Imagine! Foundation signed her up then and there, and she jumped right in! Leona has gone above and beyond even the Foundation’s greatest hopes in bringing the Imagine! message to Longmont. She has spoken to every Rotary Club, the Philanthropic Educational Organization, grandparent groups of children with developmental disabilities, and many other community organizations. She has talked with senior management and reporters at the Longmont Times-Call and has been able to interest them in developing many stories about Imagine! and its services and clients. She has also invited a large number of people to the Imagine! Celebration, has secured auction items for the event, and has donated a “Year of Baked Bread” (which has sold for up to $2,500!) for seven consecutive years. She has even established an endowment at the Longmont Community Foundation in Imagine!’s name. Leona has developed a very personal relationship with the residents and staff members at Imagine!’s Charles Family SmartHome. She often rides her bike over to the SmartHome with home-baked cookies to share. When she heard that the SmartHome needed a dining room table, she found a beautiful table top at a consignment store, persuaded the owner to donate it, and then found someone to make the table legs! Because of the deep connection she has with the SmartHome’s residents, she has played an integral part in raising community awareness and funding for the facility. A perfect example is the day she spent at the Charity Hole of the Longmont Chamber’s Commerce Cup Golf Tournament in 2009. As each cart rolled up to the hole – for five hours straight – Leona greeted each foursome with a brochure and a story about Imagine! and the Charles Family SmartHome. Because almost every player already knew and respected Leona, she was able to gently but enthusiastically encourage each person’s support. That event and countless other meetings with potential donors, talks to groups, and scores of SmartHome tours that she set up, accompanied, and often led (34 tours to date involving 179 individuals!) have resulted in critical funding being raised. What is amazing is that the enormous impact she has had through the Imagine! Foundation board is only ONE example of this marvelous woman’s influence, which has been replicated for the many organizations with which she has been involved throughout her adult life. Why, in 2016, is this still an issue? Why is the government still offering organizations grants to be doing something that the organizations should have done years ago? Why are sheltered workshops even still a thing? Imagine! began its first supported employment program back in 1984. 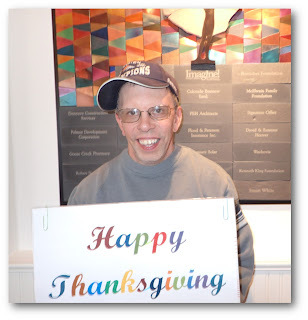 Those services, which came eventually to become an integral part of Imagine!’s CORE/Labor Source department, demonstrated clearly that individuals with intellectual and developmental disabilities (I/DD) could successfully work real jobs for real companies out in the community. We’re still demonstrating that fact today. Plenty of other organizations, both locally and nationally, are doing exactly the same. Throughout the 80s and 90s, whenever I attended conferences about services for people with I/DD generally and supported employment services in particular, the refrain was constant and consistent: the days of sheltered workshops were over. And yet, here we are in 2016, and I guess we haven’t come as far as I thought. That unhappy thought made me think of the many other ways that Imagine! has demonstrated that there are better, more effective ways to ensure that the population of people with I/DD have opportunities to become contributing members of their communities. We’ve experimented with family-directed services, family recruited employees, web-based medication prompting and alert systems, web-based family directed case management and service provider selection, and remote monitoring services just to name a few. Will we have to wait 25 years for incentives to do what should be done today? 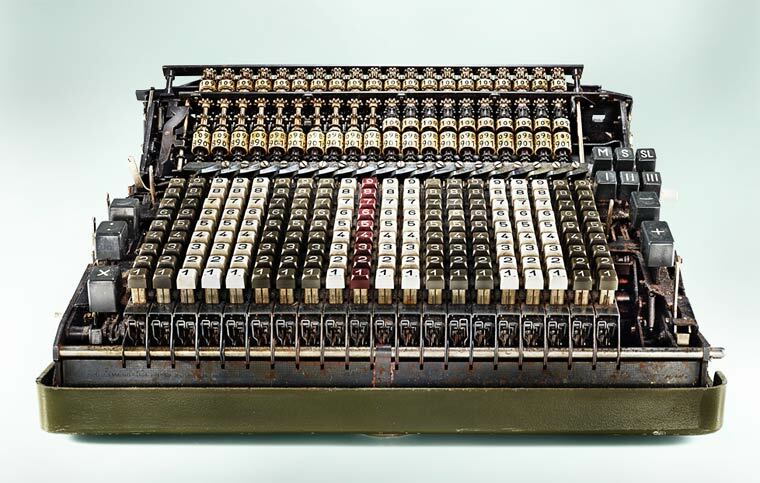 As a field, we seem stuck in our traditional patterns and I’m not sure there’s a way out. I hate admitting that, but perhaps today I’m just feeling the frustration brought on by the blog post mentioned above. I know that there are so many chances out there to open the doors of opportunity for people with I/DD. Those of us in the field, the advocates, the providers, and the regulators, shouldn’t be the ones keeping those doors locked shut. Yet, too often that seems to be the case. 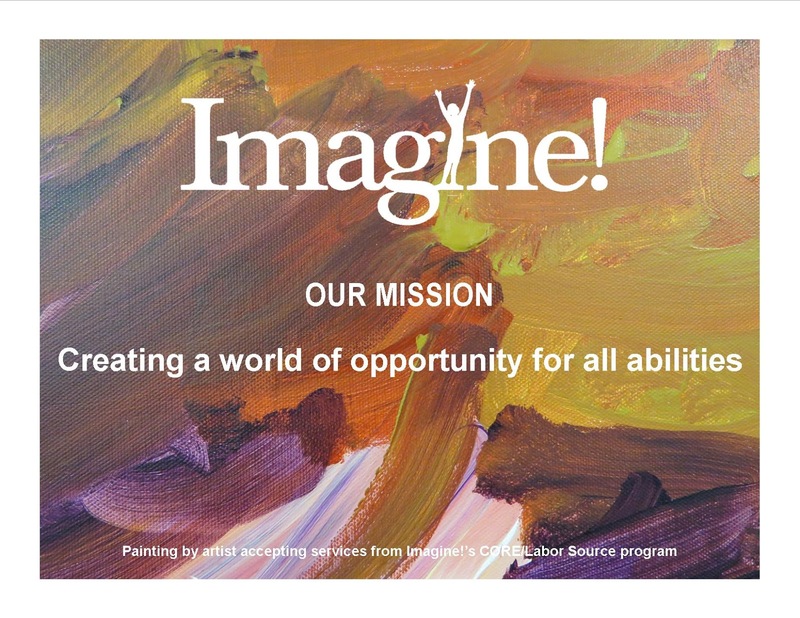 Today I’d like to share some opportunities for you to see (and purchase) fantastic artwork by individuals who accept services from Imagine!’s CORE/Labor Source (CLS) department. Longmont CLS's Art & Work class is having an art show at the Red Frog Coffee Shop in Longmont for the month of November. All artwork is for sale! And the next time you visit Imagine!’s administrative office at 1400 Dixon Ave in Lafayette, you are encouraged to take a tour and check out the CLS artwork gracing our walls. If you like what you see, all of the new artwork on display is for sale via the CLS Etsy webpage ImagineColoradoArt. 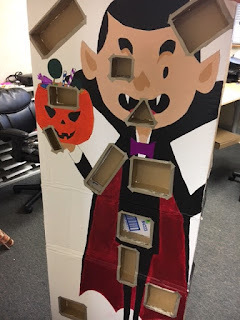 Check out just a few examples from our Dixon office below.